Want to know if social media affects SEO? A question that has increased a lot in popularity over the years is if social media affects SEO, and if so, how much? 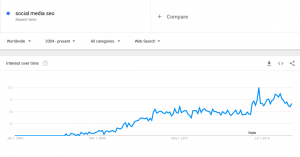 As the popularity of social media has skyrocketed, and the number of marketers and brands using it for marketing has grown dramatically, these people are asking the question if what they are doing is also benefiting SEO. We always want to get the most from our efforts, so if our social media efforts can impact our website’s SEO, that’s great news. The answer is much more complicated than that. Because social media doesn’t affect SEO in the way you might think. In this article, we’re digging deeeeep into how social media affects SEO – and how you can leverage social media for improved search engine ranking. This is the complete guide to how social media affects SEO, let’s dig right in. Okay, so social media affects SEO and search engine rankings, but it is a topic that has been very little discussed until just a few years ago. And maybe, it is because some people have been calling social media a fad and something that isn’t worth paying attention to. What better way to begin researching this topic than to hear what Matt Cutts, the former head of Google’s webspam team had to say about the correlation between social media and SEO. ”Initially, social media has affected SEO in the real-time search, where you might see individual tweets, or other links showing up. We’re studying how much sense it would make to use it a little more widely in our website search”. ”Don’t necessarily assume that just because there is a signal on Facebook or Twitter, Google will be able to access that. A lot of pages might be blocked, or links might be no-follow. It was funny because there was an SEO that said okay we see a lot of links on Facebook, and these are the pages that rank well, but that’s correlation, not causation. Instead, it’s probably that there is something really awesome, and because it’s awesome, it gets a lot of likes and ultimately gets more links, and that’s the sort of thing were the better content you make, the more people are more likely to like it. In another video, created by Matt Cutts in 2014, he answered a question on how Google separate popularity from authority when it comes to social media. And what he is saying is tremendously valuable for understanding how Google factors in social signals when ranking a website, and ultimately leveraging that to improving your site’s ranking. What he brings up in the video is that follower count doesn’t necessarily prove authority. Because there’s a difference between popularity and authority. As a result, Google uses other indications in order to be able to separate popularity from an authority on social media. Just because it takes place on social media doesn’t mean that Google abandons its main objective: to present the most high-quality and relevant search result. No matter how you’re trying to improve your website ranking, remember that quality content is the game. It all starts with that. Okay, so what does all of this mean that Matt Cutts said? We’ll first off, that social media impacts SEO is no longer a theory or speculations. It is admitted by a representative on Google. 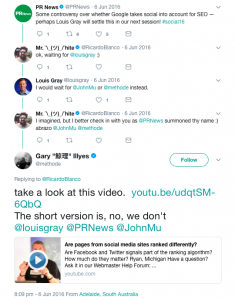 It’s important to be cautious with trusting everything different sites say about social media and SEO, but when Google themselves say something about themselves, you can expect it to be true. What Cutts indicated is that Google is a little cautious with using ranking factors that aren’t completely reliable. For example, just because you have a ton of followers on Facebook doesn’t mean you’re an authority in your space and that Google will reward you for it with improved rankings. After all, a quick search for ”buy Facebook followers” will give you a ton of results that allow you to find places where you can buy Facebook fans cheap and fake your popularity. But this isn’t something Google falls for because they realize how easy it is to do that. Instead, they look at social media indications just like they do with backlinks. Who are the people who are linking back to your site on social media? Are they authoritative? Are they trustworthy individuals? But more importantly, they look at engagement and the ”quality” of that engagement. Or are they just spam bots? 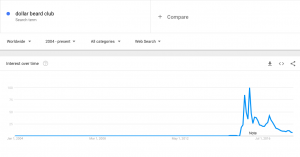 Okay, so there’s no denying that social media does in fact impact SEO. But how much? Well, Cutts said that Google is a little bit careful, but that they’ll see how they’ll view social media over time. But as more and more people are using social media and creating a ton of content there, you can expect that Google realizes that they need to be where the attention is, and factor in what 2.77 billion people are doing. A 2013 Moz Search Ranking Factor study suggests that pages with Facebook likes, Google ”likes” (+1), tweet likes and engagement tend to rank websites higher. But as Matt Cutts says in his video, it is crucial that you understand the difference between correlation and causation. Otherwise, you’ll go around drawing a ton of different conclusions that just aren’t relevant or true. It’s important to understand that just because things are correlated doesn’t mean they are causations. And like Matt Cutts said, it is often the fact that the type of content that ranks high in searches gets a lot of engagement on social media, as well as a ton of social shares because it is high-quality and brings value to the visitor. It’s not that the content that gets good rankings just because it gets lots of social shares. 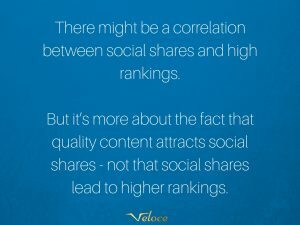 Google has already admitted that they don’t count shares on social media as individual links, however, there is certainly a correlation between shares on social media and rankings. But the explanation is that if you create high-quality, relevant content, chances are, it will be popular on social media, and as a result, people will engage with it and link to it – which in turn boost rankings. All this makes sense and doesn’t really comes as a surprise. Sites that have high ranks are established pages that share high-quality content, and this is the reason they rank high, not necessarily that they get a ton of social engagement. How social media actually affect website rankings in practice, and which factors Google is taking into consideration. Social media as a ranking factor? It is true that social media impacts search rankings, but it is also important to understand that social media is not a direct ranking factor. This means that Google isn’t looking directly at things like the number of followers, or the number of likes, for instance. Of course, it’s important to remember that Google is quite secretive with how their algorithm does things in practice and in detail, so until, and if ever, Google comes out with some information, it is impossible to know exactly how Google looks at social media, and how you can do to leverage social media for SEO. But until then, we have to go on the things we do know. This, of course, came as a shock to many people, as well as brands that had thoughts social media was, in fact, a ranking factor, and had done studies on the topic and released them saying there is a correlation (and casusation) between SEO and social media. This is probably what’s most interesting about how social media affects SEO. In one corner, we have the people who completely deny and argue that social media has zero effect on SEO. In the other corner, we have the people who say that Google uses social media as a ranking factor. Do you know what they both have in common? The real truth is that social media plays a role in SEO, but it does so indirectly. There have been a number of studies over the years that prove that there is a clear correlation between social media and SEO rankings, and yes, there is. But there is a correlation. Like Cutts said, websites that gain a lot of traction on social media often rank high in searches, but that’s not because of the traction they receive on social media, but more so that quality content gains a lot of traction on social media as well as backlinks due to its quality nature, and as a result, it deserves to be ranked at the top. In other words, it’s not the things like follower count directly that impact your website ranking, but as you can reach and impact more people, more people are likely to share your content on social media, and ultimately, as a result of this, more people are likely to link from your piece of content from their sites, news sites are more likely to make a story out of it, and authorities are more likely to pick it up. This is why social media impacts SEO indirectly and not directly. And this is important to know because there’s still a misconception among many people that when Google factors in social media in ranking a website, they look at how many followers you have, how many likes you receive, and so on. Branded searches are an important ranking factor of Google. This is when people search your brand name and another keyword phrase – or just your brand name. And with an increased brand awareness with the help of social media, it will also naturally lead to more searches for your brand as well as brand+ keywords, and when you get more searches like that, Google sees that there’s a great interest in your brand, thus rewarding you with higher rankings. Remember about Google and relevance. If people are often searching for your name, your website is likely to be relevant to the searchers, thus placing you towards the top. Do social media backlinks lead to improved search engine rankings? It’s no secret that backlinks are one of the most important ranking factors that Google uses. In fact, links have long been one of the key ranking factors in SEO. And as a result of that, a natural question of many is ”how do links on social media affect my website ranking? Are they follow? No-follow? As mentioned earlier, Google sees a social media platform just like any other platform, which means they crawl both the content and the links on the site. But that does of course not mean that the links will boost your SEO. In fact, the vast majority of links on social media are no-follow which means that the links aren’t passing any SEO juice to the website they’re pointing to. Google may, however, use the links for indexing content. This also means that links to your content from social media can speed up your content indexation. The reason why links on most social pages are “nofollow” is self-explanatory. If the links shared there would be “follow” links, people would use bots like crazy and harm the user experience for its regular users, which bots and spammers already do on social platforms that have a hard time dealing with them. Following the trail of correlation versus causation, it’s important to know that in the vast majority of cases, the links themselves aren’t benefiting your SEO as a result of not being “follow links, but the thing is, the truth is that the links to benefit your SEO. But not necessarily in the way you might think. What social media is is a tool that allows you to reach more people. When you reach more people, more people are likely to not only engage with your content but also link back to it from their site. The more people you reach, the more backlinks you’ll get, right? Therefore, you shouldn’t see social media as a tool for directly improving your website’s SEO, because the thing is, it doesn’t affect it directly. Instead, you need to understand the main SEO benefit of social media is increased reach. And this is why one of your main focuses on social media should be to grow your audience and thus also increase your reach. Because this, in turn, will lead to improved SEO. But this is not the only benefit, however. Oh, so quality matters for Google? Quality and relevant content are what drives Google, and most importantly, leads to higher rankings. What they do, however, look at, is the quality of the people who are sharing your content. In other words their authority and reputation. Because chances are, your content will be a lot more trustworthy if an authority figure with millions of followers shares your content compared to an account with 10 followers without a completed profile. So instead of simply looking at the number of people who shares your piece of content on social media, search engines are more about looking at the authority and reputation of the people who are sharing it. So how can we use all of this information to improve our SEO with the help of social media? Well, first off, I think it is crucial that we’re not forgetting about the other social media platforms than Twitter and Facebook. Because as Matt Cutts said, Google crawls all pages just like any other website. This means that platforms like YouTube and Instagram, for instance, are platforms we cannot forget to bring into the equation. Remember what Google’s main objective was? Hint: to present the most relevant and high-quality search result to what the person was searching for. It means that if you want to rank high, you need to start with the foundation. Just because you leverage social media to boost your visibility doesn’t mean that you’ll automatically improve your search engine ranking. Because after all, who wants to share and link to a piece of content that isn’t worth sharing? You can think of quality and relevance just like bounce rates. They look around for a few seconds and then realize that the content on the site isn’t answering their question, or, that it just isn’t up to quality. So the person bounces off the website by clicking back and then clicks on the search result that ranked one position lower than the other one. The person stays there for a few minutes and gets all the information they are looking for. A similar principle goes for social media. The engagement metrics on a social media post – comments, likes, and shares – are all, in theory, an indication of quality content. But we shouldn’t forget that it is incredibly easy to fake engagement on social media and this is the reason why Google is very careful with looking at just pure numbers because they can be misleading. For us people who do things the right and organic way on social media, we are able to see a clear correlation between high-quality content and the engagement it receives, right? This just proves, that in a perfect world where there are no bots, and methods you can skew your engagement, search engines would most definitely use just the numbers as ranking factors, but now, they have to go a little bit deeper and see who shares the content, who engages with your content. Social media interactions correlate with quality and quality correlates with higher rankings. But there isn’t a causation between them and improved SEO. When it comes to leveraging social media to improve your SEO, it is all about improving your content and making it high-quality and relevant. Because when your content is just that, it is more likely to gain traction, receive a higher engagement and ultimately get more links and traffic, thus leading to improved rankings. In other words, it is quality that is at the core of improved SEO – not only on social media but on your website as a whole. Well, the foundation lies in high-quality content. No matter how much you try, you can never go around that fact. It might have worked back in the days with methods like keyword stuffing, and other black hat SEO tactics, but today, Google is simply too smart. And if they’re not smart enough yet, they will be, and when they do, they’ll punish you. The foundation for creating high-quality content is first creating a content strategy, of course. Having a content strategy allows you to craft and create more high-quality content that is far more likely to resonate with your audience. Another way to increase the chances of you actually benefiting from social media is to encourage engagement. Increasing engagement on social media is an art that needs t be masters, and there are tons of approaches you can take to boosting it. A factor that Google actually looks at is how many times links that are shared are clicked. Because this is considered a social action. This is part of the reason why you should always craft content (and links) with the user in mind first, and then the search engine on second place. Don’t just create links purely for SEO purposes, because this is considered spam. Instead, create them with the user in mind. We now know that the main benefit of social media in SEO is the fact that it can boost your backlinks if used in the right way. But how can you use social media to actually get backlinks and get people talking about your content? I’m going to let you in on a little secret, and that is that just sharing a few posts and waiting for people to start sharing it and linking to it like crazy just isn’t going to happen. The first step to driving backlinks from social is obviously creating content that is worth linking to. But once you’ve done so, there are approaches you can take to further increase the visibility of your posts, and ultimately boost your rankings. The more eyes you can get on your content, the more people are likely to link to it. Therefore, don’t underestimate the value of repurposing and reposting content. If you donate yet have share buttons on your website, you’re missing out. Implement share buttons, but be careful with how many you use. Studies have found that the more choices you give to your visitors, the harder of a time people will have to make a choice, and as a result, they might end up not sharing it at all. Optimize the share buttons on your website for maximum clicks. It should be easy to share your content. Identify the people who share your content and thank them. When you show that you value them, they are far more likely to share your content again and become loyal supporters of your brand. People are sharing your competitors content on social media, so why can’t you get them to share your content? Identify the people who are sharing your competitors content and let them know about your content as well. Don’t be too pushy, and you’ll be surprised at how many people actually do it. One of the best ways to increase your social shares and engagement is to build strong relationships with your audience. Firstly, the stronger relationships you’ve built with your audience, the higher your engagement will be, which also includes social shares. And when you receive more social shares, you’ll reach a bigger audience, thus boosting the chances of getting backlinks and mentions of your content. But the single most beneficial thing about social media and SEO is that it opens up for tremendous opportunities to build relationships with people. This is why, you should aim towards, and invest lots of resources in building relationships with not only your customers and target audience but also the people who might be willing to link to you and mention you on their website. This can be everything from bloggers, journalists, influencers, editors, and more. You know that there’s a huge difference between cold-emailing someone and asking them for something, compared to getting in touch with someone you’ve built a relationship with. When you’ve built a relationship with them, they are more likely to do something for you. However, you need to remember that in order for them to be more willing to do something for you, you need to have done something for them. In other words, it shouldn’t be a take-take relationship. It should be a give and take relationship where both parts feel like they’re benefiting from the relationship. This is why you need to ask yourself ”how can I bring value to them?”. And don’t just do this right before you’re about to ask for a favor because you’ll lose both credibility and integrity. Instead, it’s about giving without asking for anything in return. Because if you do, the other person will feel guilty about giving something of value back to you. And the next time you ask for something, they’ll say yes. See social media as for what it is: a tool for you to be social, engage, and build strong relationships with people who can be beneficial for your brand. If you want to increase your social shares, and ultimately get SEO benefits from social media, you need to look at user-generated content. In case you’re unfamiliar with user-generated content, also known as UGC, it is content created by the user, but in marketing context by your audience. UGC can be everything from reviews, testimonials, social media posts etc. User-generated content has many benefits, but the main benefit of it is that it carries a lot of trusts, compared to content created by a brand. What’s more, considering the fact that content can be both expensive and time-consuming to create, UGC it gives you free content dedicated to your brand, saving you lots of resources – if you take advantage of the UGC your audience is creating. A great benefit from the user-generated content on social media is that it allows you to better understand what keywords your audience is using when talking about your brand and niche, thus giving you the opportunity to better understand your customers and optimize your website for those keywords and improve your rankings. In other words, not only does UGC provide you with valuable and powerful content, it also allows you to use it for doing research and leverage it for more boosting your SEO. User-generated content also boosts your visibility. The more people mention and talk about your brand on social media, the more you’ll increase your visibility. And when you increase your visibility, your chances of getting backlinks, as well as boosting your traffic increases. This is why you should encourage your audience to share user-generated content, and show appreciation to those who do. There have been lots of discussions and speculations on how going viral on social media affects SEO. And the true and final answer is that it does. But not in the way one might think. But since you now know how social media affects SEO, you probably know where I am going with this. Firstly, going viral tremendously boost your branded searches on Google. And as you know, the result of more branded searches is that you’ll rank higher. Eventually also for keywords that are relevant to your industry that you are currently targeting. Google wants users to effortlessly and quickly be able to find what they are looking for. What’s more, we cannot neglect the fact that going viral greatly increases your brand awareness and most importantly, the backlinks to your site. When Dollar beard club went viral, they gained a ton of press and mentions from a ton of reputable sites like whose backlinks are worth a lot in the eyes of Google. What’s more, them going viral has caused me to write about them now. A social platform that isn’t spoken a lot about, but still has proven to affect your website ranking is Google+. And that’s not so strange really, considering the fact that it is created by Google, and that they have full trust in it. Google+ is, in fact, the only social platform that has a direct impact on your SEO. What’s more, with Google+, you can get posts that you share on there to rank for keywords included in that post. The biggest impact Google+ has on SEO that you need to know about is personalized Google searches. For instance, if a person has connected (joined a ”circle”) on Google+, and that person ”+1s” a post related to something specific, for instance, ”tires” that page will rank higher when the person searches for that term on Google. A major benefit of posting posts on Google+ is that Google indexes your content a lot faster, thus improving your content’s ranking faster. But it is also said that the more engagement and the more active you are in social media, the more positively Google+ will benefit your SEO directly. When it comes to SEO and social media, the platforms that are mostly spoken about is Facebook and Twitter. And part of that is the fact that Matt Cutts, in his video back in 2010 said that they looked at Facebook and Twitter when ranking content, however, in the latter video that he released, he also mentioned that Google indexes a social media site just like any other site. This means that other platforms apart from just Twitter and Facebook are brought into the equation a well. Don’t just get stuck on Facebook and Twitter. One platform we cannot afford to forget is YouTube. In fact, YouTube is the second largest search engine behind Google. The best part is that you can leverage YouTube for boosting your SEO. Infographic act, with the power of video content, you can increase your visibility and increase brand awareness. From that, you can gain more backlinks, but also get your video content to rank on Google, thus allowing you to attract new audiences to your brand. Like I’ve mentioned earlier, the biggest benefit of social media when it comes to SEO, and marketing, in general, is that it allows you to reach a bigger audience. And when you have more visibility, more people are likely to link to you. So what should you do to increase your visibility? You should put lots of resources into building our audience of course! Because when you have a larger audience, you’ll be able to reach more people, thus increasing your chances of getting picked up by someone who might link to you. There are many ways you can build your audience on, but you need to think about the fact that what approaches you should take depends on the social media platform you’re using. What works on one platform might not work on another one. But what always work, no matter which platform you use is content. It is simply something you cannot afford to ignore. ”build it and they will come” because, in the saturated landscape of social media, it just doesn’t work that way anymore. Now, you need to actively go out and attract people to your brand and to ultimately start following you. 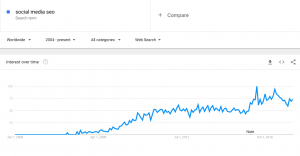 Social media affects SEO, what will happen in the future? Social media is having a huge effect on humans and how we communicate. It also affects how we search for information we are looking for. The shift we see is slowly happening is that people are actually starting to turn to social media for information, turning social media into search engines. After all, YouTube is the second largest search engine today. But as social media is starting to take more of people’s attention, and more and more people start using it, you can expect search engines to take more of what is happening into consideration when ranking websites, because by looking at all the information that is being created and distributed on social media, we can learn a lot about human behaviours, and even more about the individual to better tailor search results. This might mean that Google will turn social media into a ranking factor in the future. Already, they’ve indicated that they are looking at it. After all, if you aren’t taking acknowledging something that billions and billions of people are spending hours on every day, you’re clearly missing something about what is happening in the world. There is no reason why social signals won’t become a ranking factor at some point in the future, so why not start leveraging social media for SEO today, and you’ll have a head start once it is happening. It is just like the brands that are still clenching onto traditional advertising and essentially pouring the majority of their marketing budget in the drain because of its inefficiency. Eventually, they’ll be surpassed by modern brands who understand the modern and traditional way of marketing, and we’re already seeing it happening today. There’s a small problem with social media and Google. In fact, Google has said that in order to be able to use social media as a ranking factor and to look at social media as an indication, they need to be able to index the social media platforms. And in the video with Matt Cutts, he said that Google has had one experience where they were blocked from indexing the website, and when that happens, they aren’t able to extract the information that is on there, and thus use it for SEO. Google was blocked for roughly a month from indexing Twitter’s site, and this is a problem with using social media as a factor in ranking because it isn’t always sure that they’ll have access to the information that is on there. Another problem is that the information on social media changes so quickly. If, Google indexes a social media platform at a specific time, and then directly after, that information changes, the information that Google has will be irrelevant. And this is, as Cutts said, something that Google has to think about when looking at social media. Social media has an impact on SEO, but not in the way you might think. Instead of being a ranking factor of Google. It has an indirect effect on your search engine rankings. This, in turn, can lead to more backlinks. Which in turn can lead to higher rankings. It’s not that having lots of followers or a high engagement is used by Google as a ranking factor. But who knows what happens in the future? PrevCan Employees Play a Larger Role in Saving Energy?